Sophomore forward Arnaldo Toro gets swarmed by three VCU defenders during a men's basketball game Saturday. On Saturday, men’s basketball let its afternoon road game against VCU get out of hand. The Rams’ second-half lead went as high as 27 points, and a large part of the half appeared more lopsided than competitive. 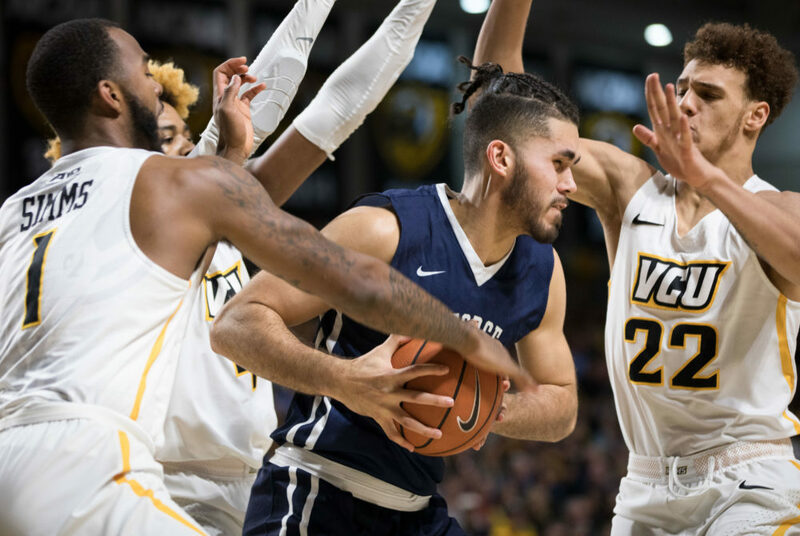 After the loss – GW’s fifth by double digits in less than three weeks – head coach Maurice Joseph chalked up the night’s result to two things, effort and energy. As the Colonials (9-11, 2-5 A-10) have continued to accumulate conference losses, increasing their effort and “will to compete” has been a consistent point of emphasis that Joseph and players have talked about after every recent contest. Over GW’s past six games – including five Atlantic 10 losses – opponents have shot 48.3 percent or better and made an average of 5.8 more field goals than the Colonials. Both Joseph and players have highlighted the team’s lack of competitive spirit after four of the last six contests, but they said there was improvement in two of those games. But other errors limited the Colonials’ ability to pull ahead. During GW’s only win of January thus far – against George Mason Wednesday at the Smith Center – senior guard Yuta Watanabe led a defensive effort that prevented the Patriots’ top scorer from making an offensive impact. Still, George Mason shot 51.1 percent from the field and caused trouble for GW’s defense with eight three-point makes. The weekend before, against Richmond on the road, Joseph said his team played with more energy. But the Colonials had difficulty staying competitive in the second half and made numerous unforced errors that led to Spiders runs and a 10-point loss. Joseph said he was satisfied with the team’s first-half performance on both sides of the ball against VCU, but as the team got tired and started allowing easy baskets, the Colonials’ intensity dissipated. The Colonials have been outscored in the second halves of each of their past four games. Despite finishing with double-digit losses, GW was in competitive contests with Richmond and VCU at the halfway mark. After early scoring success, GW’s starting backcourt – freshman Terry Nolan Jr. and sophomore Jair Bolden – struggled to handle pressure from the Rams. The duo combined for eight turnovers on the game. They both have also had recent scoring inconsistencies, with Nolan going scoreless against Duquesne and Bolden adding six or fewer points against Rhode Island, Davidson and VCU. The Colonials travel to Olean, N.Y. to take on St. Bonaventure (12-6, 2-4 A-10) next Sunday – with both sides searching for their third conference victory. The Bonnies showed firepower early in the season with a victory over Syracuse and an eight-game win streak in November and December. The team has two of the league’s top players – senior guards Jaylen Adams and Matt Mobley – but the Bonnies’ recent losses have lowered their expectations since the season’s start. Joseph said the Colonials will spend the extra days prior to the St. Bonaventure game working on defense, rebounding and turning around their losing momentum. Nolan said he and his teammates know they need to play better and they are ready for an intense week of practice ahead. This article appeared in the January 22, 2018 issue of the Hatchet.